Mayo, FL--The wet weather continued in northern Florida and southern Georgia, and the rivers remained high. 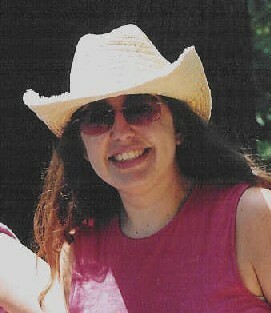 Nevertheless, the Fellow Travelers decided to make an overnighter on th e Suwannee on August 23 and 24, 2003. Franklin Sutton (the jester) brought his grandsons Jason, Jeremy, and Jacob Sutton, and their friend, Chase Keigans. Jack and Carolyn Chastain decided to make their first overnighter. Tim Eidson was late (again). But that crew met at Charlie's house to meet the other canoeists. The first stop was at McDonald's in Madison where the Moultrie folks met up with Joey Autrey, his daughter Nicole, Nicole's man of the day Matthew Worthan, and Carla Pollock, who wanted to retain her title of playmate of the day. After a gourmet breakfast (well, still not a Roy Moye breakfast, the caravan headed to Dowling Park. Art Shelfer, John Williams, and Haley Chauncey were already there, not having been delayed by the knave Tim. All the vehicles and camping gear were transported to Yana Blue Springs Park where Edith Hamlin was expecting the congregation. After a ride back in the bed of Art's S-10, everyone paired off to canoe. Well, John and Charlie did not really pair off since they both got to do their favorite type of paddling, solo. The weather was superb at first. The river was high, and the current did not demand any particular skill or effort. 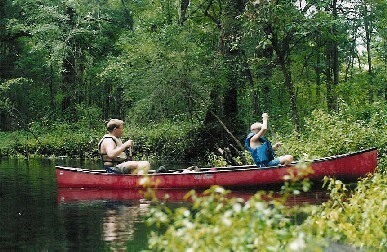 By the time the Suwannee reaches Dowling Park it has been fed by both the Withlacoochee and the Alapaha, and is a big river. The limestone banks have given way to forested banks and to quite a few houses. 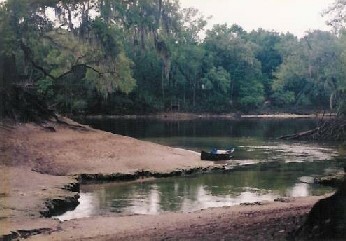 The sandbars found on the upper Suwannee are not evident even at lower water levels. But the upside of the equation is that the pretty springs are mostly located in this area. The paddling was mostly uneventful, just the usual water splashing and good conversation. No one had difficulty keeping up, and there was some genuine "just floating" time. It was after ten by the time the journey began, and Charles Spring arrived about dinner time, as did a small shower. The spring was not at all clear, but there is a county park there. It has a paved parking area and some trash cans, but no restroom facilities. After eating Vienna sausage and boiled peanuts, and giving the aging Jester time for a short nap, the group headed downstream. The rain had ceased. It was not a long trip to the spring run from Anderson Mill Spring, and the travelers decided to paddle the approximately half-mile to the spring. That was the prettiest part of the entir e trip. Although the high river added some tannic coloring to the usual blue, the water was sufficiently clear to observe hundreds of large fish and a few big turtles. There was some maneuvering to clear the many trees, and some places required ducking to clear the overhanging shrubs, but the greenery was delightfully beautiful. Charlie led the way in the solo Prism, and most of the others did not have to fight the spider webs. Once that side trip was completed, it was back on the big river. The weather was threatening, and distant thunder was heard, bu t everyone reached Blue Springs Park in the dry. Upon arrival, the tents were pitched, and then a gentle rain did come. At first it was refreshing just to sit in the shower, but as it grew a little heavier some took naps in the tents and others headed for the picnic shelter to share accumulated wisdom. Diane Stines had originally planned to make the trip, but she backed out at the last minute. But she did come down to spend the night and share a coconut pineapple pie she had made. The meal was Sonny's (Pressley, not the chain) barbecue, potato chips, and coleslaw. John Williams prepared his own supper, and he got really sick. He left and spent the night in a bed and brea kfast nearby, but he was back on Sunday morning. After supper, the boys built a fire and made smores. Diane told a Jack tale, and some to the adults told lies. There were not prize-winning lies told this time. There were a few ghost tales told for the benefit of the kids. Breakfast was sausage and pancakes. Jeremy Sutton and Charlie did the cooking, and everyone said it was delicious. But then, lying is part of any Fellow Traveler trip. Sunday was Nicole's eighteenth birthday, so everyone sand happy birthday. Jack Chastain sang lead. It was also Ellen Stines' twenty-third birthday, so the King called her on the cell phone and everyone sang to her. She asked where we were, and the reply was that we were in the insane asylum. She probably believed that. After shuttling three vehicles to the take-out at Telford Spring, the Sunday morning paddle began. Frank and his crew got a good head start so that the boys could enjoy some swimming in the river, and they really had some fun. Once the rest of the paddlers caught up with them, they got back into the canoes and headed downriver. 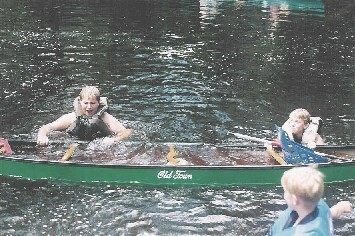 Chase Keigans and Jason Sutton canoed alone. It was the first time Chase had ever canoed, and the eighth-grader did as well as anyone else on the trip--except at the very end. There was a snack stop at Perry Spring. The spring was not at all clear, and there is a huge hou se being built adjacent to the spring. Charlie and John swapped solo canoes so that John could give a more professional opinion on the King's eBay prism. It was a relatively quick trip past the Hal Adams suspension bridge at SR 51 and on to Telford. 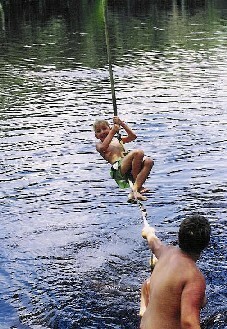 When Tim arrived, he fell into the water (again). Chase and Jason managed to turn the Gunn boat over as they approached final take-out, but that was just another opportunity for them to play in the water. After lunch at the spring, John, Art, Frank, Jack, Joey's group, and Charlie went back to Blue Springs to take down the tents and get the other vehicles. Everyone else stayed and played in the spring. 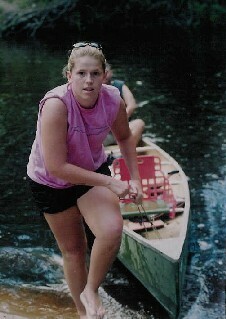 After that, the canoes were loaded and everyone headed home.